I didn’t grow up eating whoopie pies. I guess they weren’t really a thing in Canadian suburbia. I do remember Ding Dongs, which are two cakes sandwiching frosting, so that’s kinda sort of the same? Actually, it’s not the same at all. Really, I have no idea when I first tried whoopie pies or why I decided to make them, but I do remember that the first ever whoopie pie I ever ate was a pumpkin one and I made it myself! Oh wait, now that I’m thinking about it, I think I remember discovering whoopie pies at the Baked bakery in NYC. Waaaaaaay back in the day, the second time Mike and I visited NYC I suggested going to Baked. He was totally down, but when we got there, he asked me, “really? !” I totally didn’t get what he was talking about. I mean, it was kind of a sketch area, but it seemed okay? Well, we were fine and I remember getting a box of goodies, sans whoopie pies. Then, shortly after, I remember seeing Martha Stewart doing a show with the guys who own Baked. Whoopie pies are one of their biggest sellers. Anyway, long story short, I love pumpkin whoopie pies! 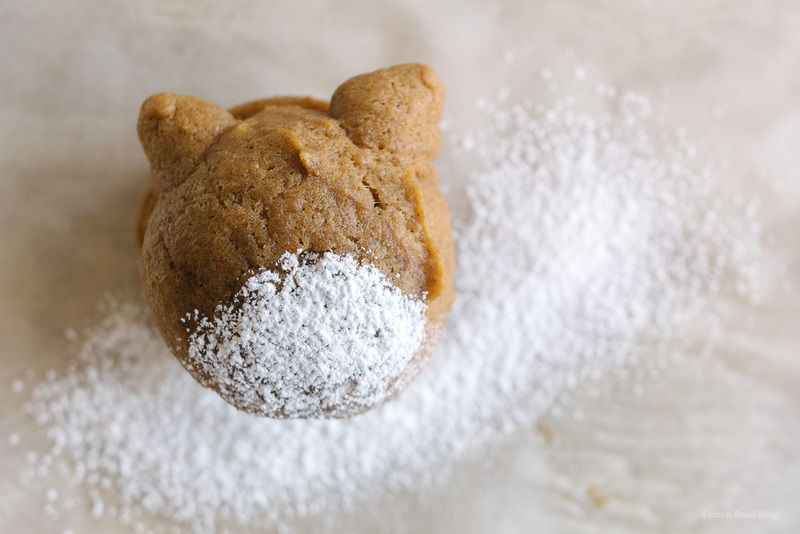 Soft pumpkin-y cakes sandwiching cream cheese icing? What’s not to love? And these guys are made infinitely more lovable in Totoro form. Ultimate cuteness unlocked! PS – Check back here on Saturday, I’m going to be doing a round up of all the cute Totoro goodies that were posted for Totoro Week! In a large bowl, whisk together the dry ingredients. In another bowl, whisk together the oil and brown sugar. Stir in the pumpkin. Mix in the egg and then stir in the dry ingredients. Let the batter rest for 10 minutes. Use a cookie scoop to scoop out mounds of batter. If needed, dip the cookie scoop into water for easier release. Shake off excess water before scooping. When all the batter is scooped, use a toothpick to pull out ears. I only pulled out the ears on half, but your Totoros will be more stable if you do ears on all of the cakes. Bake for 10-12 minutes. Let cool completely while you make the frosting. Beat the butter and cream cheese together until smooth. Beat in the vanilla and then add the powdered sugar in gradually, mixing well. 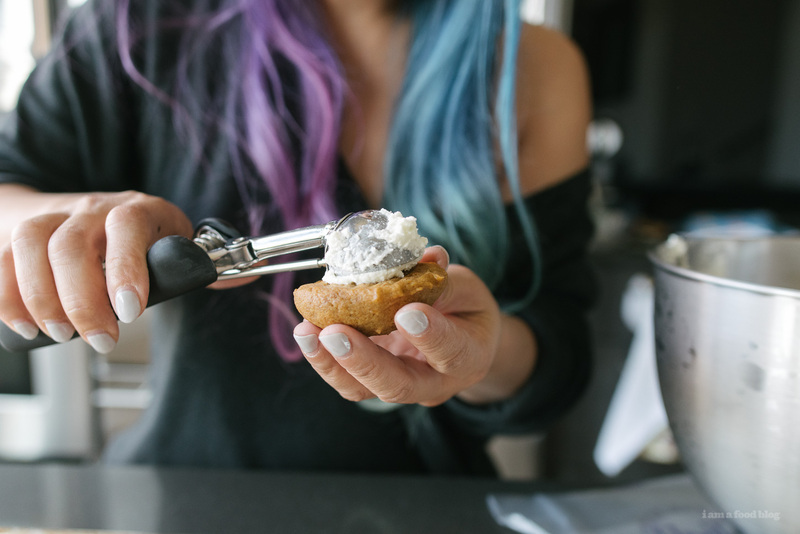 When the cakes are cool, use a cookie scoop to portion out the cream cheese frosting, about 1 to 1.5 tablespoons per sandwich. Sandwich two cakes together into a whoopie pie. Use a piece of paper to cut out a template for Totoro’s belly. Eyeball your pies, then cut out half a circle. 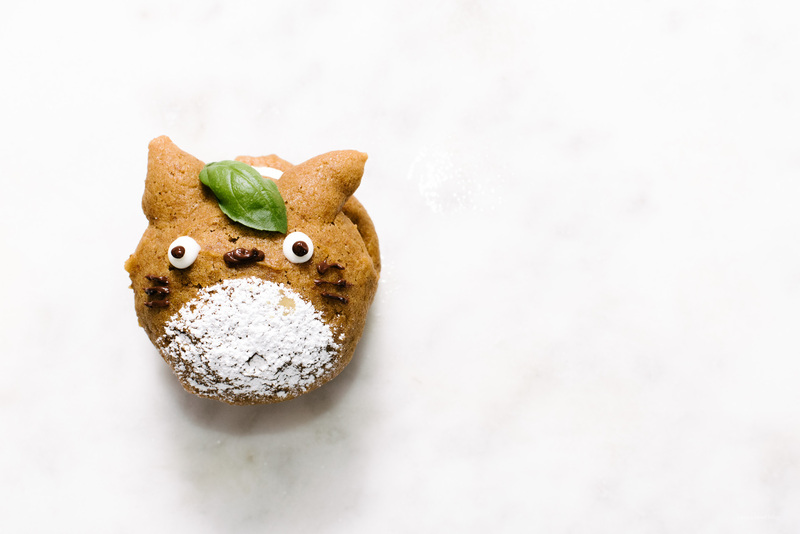 Hold the paper over the pie and lightly dust to make Totoro’s belly. 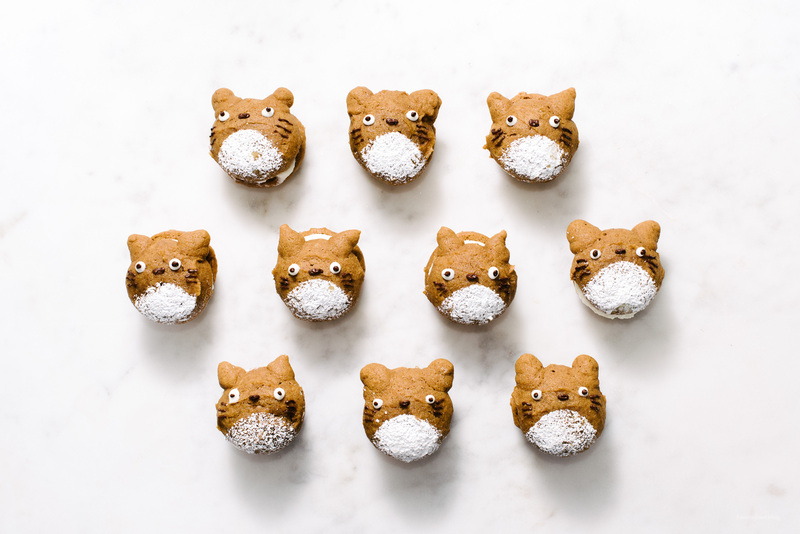 Pipe out some cream cheese frosting as the whites of Totoro’s eyes, then use nutella to pipe in his eyeballs, nose and whiskers. Enjoy! i’ve had my share of taking people to sketchy places for food; there was the time that the korean restaurant i picked out was next to an adult bookstore, and how about the two times i went to mr. holmes (in the notorious tenderloin in sf)? anyways, glad your first baked experience was a safe one and glad that it let you to make these (can’t control my squee’s!). ahhh their little basil leaf toupees/hats!!!! 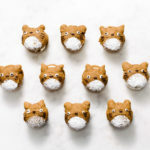 Oh myyyy are these unbearably adorable!!!! 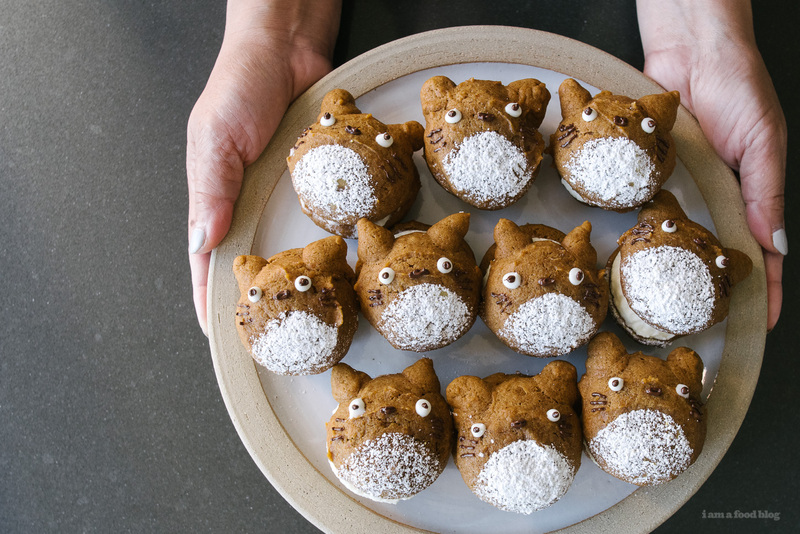 I love the look of totoro and these belong in a window display at some LA bakery or something. :D Bravo. Oh my word! I have to make these with my son for his beloved teacher. 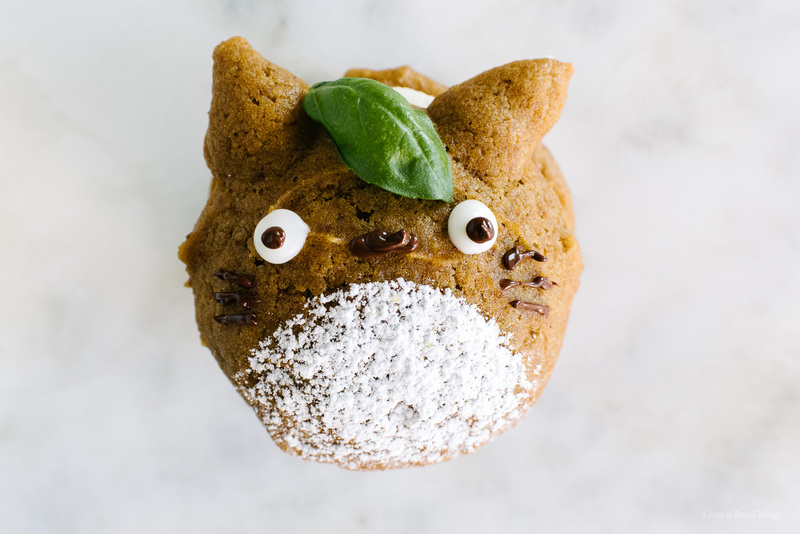 My son is obsessed with Great British Bake Off and would love to bake these, and his teacher is obsessed with anime and baking! She will die. BUT we can’t get canned pumpkin easily in the UK. I have plenty of squash/pumpkin I could use – do I just cook it and puree it? Is that the same thing?